The House of Jones: We sort! We pack! We rearrange! We sort! We pack! We rearrange! Another hard day of sorting, packing and rearranging! Rebekah has had three great nights in her toddler bed. But, last night, she said, "I want sleep in baby bed!" We knew we had to break down the crib. She cried at first. We disassembled the crib and put her toddler bed where the crib was, she was happy and ready to go to bed. Where did all this stuff come from? Even with all this gone, they still have tons of toys left. Good thing now from the clean up, they are seeing some toys they haven't seen in a long while. 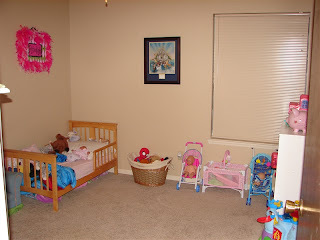 During the sorting process, we managed to clean up and organize both of the girls rooms. Rachel lost the kitchen to Rebekah's room. 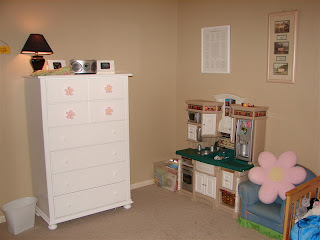 This freed up some space in Rachel's room and we moved her cubbies to clean out the corner. 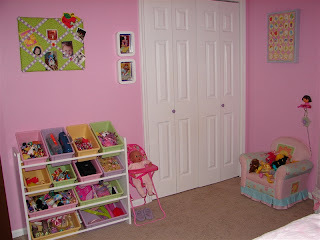 Now her room looks more spacious and her closet neat and organized. Rebekah lost her bookshelf, glider and crib; and gained the kitchen and cubbie shelf from the living room. 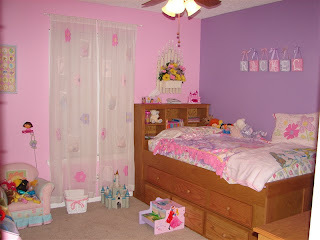 I kept out one tub of books and they are in her room along with all her baby doll stuff. As you can tell, the pictures are the after shots and before the mess hit tonight. I can't believe how spacious Rebekah's room is now! I am glad we did this. And, to my surprise, the girls have been great about the packing up of half or more of their toys! What's on the agenda for tomorrow? Well, I'm glad you asked. We're going to tackle the living room. With the toys gone, we now have one bookshelf to pack up, top of the entertainment center to clean off, shred a bunch of papers and clean off the desk. Sound like enough?!? And when Jon Paul gets home, we need to measure the attic opening and go buy the new ladder. Oh, and did I mention that I had a filling come out while I was eating a piece of cheese? Yes. It did. Which means in the middle of all this, I need to go see my dentist! Fun...NOT! Wow. I cannot even imagine how busy you guys are doing all this. It's so wonderful you have help! And I think I have a filling trying to loosen up. I noticed it today. How weird is that?